Build-A-Bear Workshop was named to FORTUNE magazine’s annual list of “100 Best Companies to Work For” for the 5th year in a row and we are BEARY excited! The list was revealed in a surprise announcement this morning on FORTUNE’s iPad App. Details and features on all of the honored companies will be posted online tomorrow at Fortune.com/BestCompanies. We can’t wait to have more details when the full announcement is made and even more info when the print issue is released next week. Sustaining a position on this employer of choice list for 5 years is truly one of our most PAWSOME accomplishments. Our Associates are the heart of our brand. When our Associates have fun, our Guests have fun. Thanks to all–our Associates, our Guests, our vendors and all stakeholders for helping us be amongst the BEARY best! This weekend marks the 15th Birthday of Build-A-Bear Workshop! Our first store opened at the Saint Louis Galleria in St. Louis, MO in October of 1997 and we’ve been sharing smiles and making memories with our Guests ever since. As part of our birthday celebration, we are inviting Guests to make special stuffed animals for free to donate to Toys for Tots in the U.S. and Salvation Army in Canada on Saturday, Oct. 20 and Sunday, Oct. 21. This special effort will help kick off the holiday toy drives for both organizations this season. Build-A-Bear Workshop is a company with heart and Stuffed with Hugs is a way to give our young Guests the opportunity to give back. Over 30,000 stuffed animals will be made and donated to children who might not otherwise receive gifts this holiday. As we celebrate our birthday, we also commemorate 15 years of giving back to important causes around the world. Supporting causes that are important to our Guests- like children’s health and wellness, animals, and literacy- has been a part of the Build-A-Bear Workshop teddy bear culture of sharing and caring since the very beginning. Build-A-Bear Workshop and its foundation have given nearly $31 million to these important causes and we have always shared the hug of a teddy bear wherever needed locally or abroad. We are looking forward to continuing this commitment to giving back through Stuffed with Hugs. Participants can meet Build-A-Bear Workshop mascot, Bearemy® and enjoy a variety of 15th birthday celebration activities. As a thank you for helping, Guests will receive a Build-A-Bear Workshop coupon for a future visit. To learn more about Stuffed with Hugs weekend activities or to find a store in your area, visit buildabear.com. I hope to you can visit a Build-A-Bear Workshop store near you this weekend, participate in Stuffed with Hugs, and help brighten kids’ holidays with teddy bear hugs! INSPIRE ME! BECOME A 2012 HUGGABLE HERO! Our 2012 Huggable Heroes--What an incredible group! It’s a new year! Every January, I reflect upon the previous year, and think long and hard about what I can learn from it. And every year, without fail, I am amazed at how much I learn from young people who are changing the world. I am always inspired by their drive and commitment to make a difference, and so I make it an annual mission to reward these passionate kids who teach me and all of us so much about helping others. Today, Build-A-Bear Workshop launches our ninth annual Huggable Heroes search for young people who go to extraordinary lengths to make the world a better place. The program was created to encourage and empower kids – ages eight to 18 – to be community service leaders and to award them for accomplishing great deeds. Anyone ages eight and above – parents, grandparents, relatives, teachers, community leaders, even young people themselves – may nominate a candidate. Entry forms are available at Build-A-Bear Workshop stores in the United States, Puerto Rico and Canada or online at: buildabear.com/huggableheroes. Nominations will be accepted through February 27. Entries will be narrowed down to 80 semifinalists in March and to 30 finalists by the beginning of May. Ultimately 10 new Huggable Heroes will be selected to join the ranks of more than 100 other amazing youths from the previous eight years. Each new Huggable Hero will receive a $7,500 scholarship toward his or her college education and a $2,500 donation from the Build-A-Bear Workshop Foundation for a cause of his or her choice. Also, the Huggable Heroes will receive a video camera and a trip to St. Louis to celebrate their accomplishments, participate in a professional photo shoot, and meet fellow 2012 Huggable Heroes. From Nicholas and Cassidy I learned the importance of staying positive when presented with hardships, using personal experiences to help others in similar circumstances. From Shannon, Kyle, Rujul, Justin and Armin, I learned to look at issues impacting other countries, see if there’s a way to solve them and then to take action. From Shaun, Jasmine and Deventae, I am reminded to always look around the community in which I live and support those in need – whether they be sick, hungry or lacking educational resources. You can read all of the 2011 Huggable Hero stories at buildabear.com/huggableheroes. I hope you are inspired by these stories, learn from them and take up a cause of your own. Because whatever you can do, no matter how big our small, you can make a difference. What kind of stories about giving back will we hear in 2012? I hope to hear yours or one you share about a friend, and wherever the stories come from, I have no doubt I will be inspired by them. We look forward to hearing about the next group of young leaders and givers. •	Walk the walk. Get involved yourself; participate in charitable events on behalf of causes you believe in. •	Include children in volunteer efforts. Provide opportunities for children to see and act on the needs of others so they learn first-hand how they can make a positive difference. •	Start small. Do little projects to help others and begin at an early age. •	Consider a charity allowance. Set aside a percentage of each child’s monthly allowance for charity and let them decide where to donate the money at the end of six months. •	Support them. Allow their ideas to flourish and help their dreams become reality whether that means lending moral support, providing necessary transportation and equipment, or giving them a pat on the back to keep them going. •	Remember: Encouraging your children to participate in charitable endeavors is a gift to them, as well as to the people whose lives they touch. The invention of a lifetime! My travels take me across the world to many great cities and when I visit our stores, to many great malls. To many people shopping is mundane and a nuisance. To me it is and always has been fun and enlightening. I have found some great ideas for our business looking at other businesses. From airlines to hotels and restaurants to museums and retailers–all of this is a great laboratory for us to see what the public likes and what we can adapt to our own bearstyle. I am especially a sucker for great packaging. Today was no exception. My day was spent in Chicago–just an hour’s plane ride from St. Louis. The day was beautiful for travel and not too windy or cold. My ultimate reason for being in Chicago was a meeting with one of our landlords but on the way we got to stop at a mall in DT Chicago and then catch a quick bite of lunch before the meeting. It was at the condiment center that I saw the most incredible idea–this new ketchup container. For years I have torn open the old ketchup pouch–maybe used 2-3 for one small order of fries. But not anymore–at least not at Chick-Fil-A. 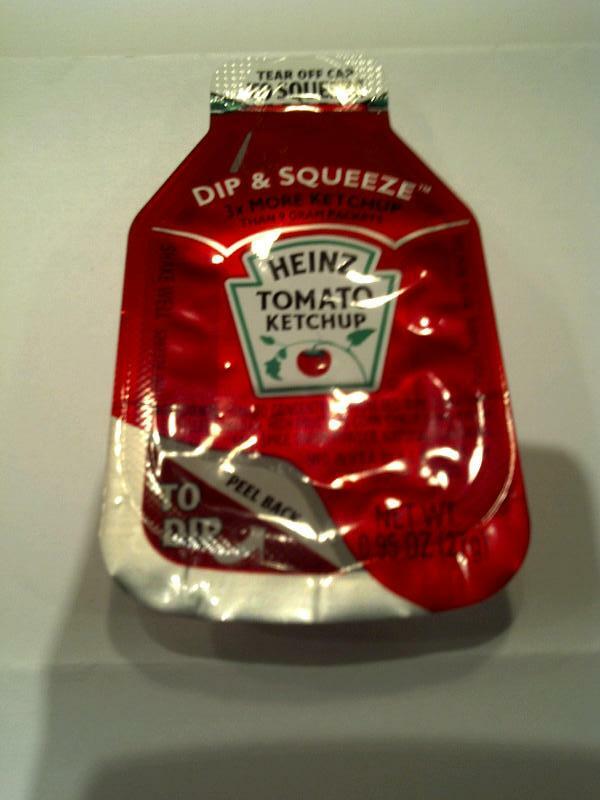 Enter the new Dip and Squeeze Heinz ketchup container. It’s even shaped like a ketchup bottle. You can open at the top to squeeze on your fries or sandwich or peel back to dip your fries into the container. In the same size container, you get 3x the ketchup, no messy fingers and you only use one. No mess and less packaging waste. BEAR-ILLIANT IDEA!! It was one of those moments that makes you say, “what a great idea” or ” why didn’t I think of that?” What this said to me above and beyond just the nice experience of clean fingers and less waste was someone was out there thinking and doing. Someone was as irritated as the rest of us but did something about it. Someone took an idea to reality. This is the best of a creative mind at work–someone sees an everyday activity –eating at fast food restaurants and saw an opportunity to turn a nuisance into a pleasure. Not through high tech but through simple packaging. I am sure that engineering and design entered into it and someone at Heinz had to have the sense to see the business opportunity and back the product and Chick-Fil-A bought it. This is what makes ideas and what makes profits–a need or a void is filled by someone taking action–doing something rather than just lamenting about it. I don’t know the inventor but I took an extra ketchup just to remind me to keep looking and listening. Ray Kroc didn’t invent hamburgers and Howard Schultz didn’t invent coffee—they just invented how to make both better and sell more! Everyday an idea is staring us in the face if we just live our lives with open eyes and SEE the opportunity and as we like to say at Build-A-bear: GO FUR IT!! Thanks Heinz and Chick-Fil-A–you made my day! One of our best moments at Build-A-Bear Workshop was the creation of Holly and Hal Moose. My two favorite antlered siblings, Holly and Hal Moose, are back just in time for the holidays! You may remember when “Holly and Hal Moose: Our Uplifting Christmas Adventure” first aired on television nationwide two years ago. For Build-A-Bear Workshop®, this was the first time that our stuffed animals were brought to life in an animated feature film. This season, we welcome Holly and Hal back to TV, airing on the Hub TV Channel Tuesday, November 22 at 1pm EST and Sunday, November 27 at 9am EST. “Holly and Hal Moose: Our Uplifting Christmas Adventure” is one of my favorite holiday stories because it tells the tale of an unlikely sibling pair who work together to save Christmas. Their journey is an inspirational reminder to always follow your dreams-no matter how big they may seem. Holly Moose the level-headed inventor, always helping her younger brother on his latest adventure. Much like Holly and Hal, I too dared to dream big and the result was Build-A-Bear Workshop. When I was growing up, my family told me I could be whatever I wanted to be- no matter what! That mentality stuck and I have always been a dreamer. Originally, that dream was to be a lawyer. I only took my first job in retailing to save up the money to go to law school. Of course, while at the May Department Stores Company I found my true calling. Several years later, when I left Corporate America, I still didn’t know what company I would create but I never stopped dreaming the dream supreme. “If you can live your imagination, your life will be a dream come true.” My life is a dream come true! Each of us are born with certain gifts that help us turn talents into passions and develop our own worth ethic. It starts by believing you can truly achieve whatever you set your mind to. Many people get so caught up in what they can’t do that they don’t know about how much they can accomplish. Focus on the positives. You alone are responsible for creating your own success, so don’t let outside forces limit your possibilities. I never put restrictions on my vision, nor did I let the way others made or sold stuffed animals stand in my way. Instead, I allowed myself to dream of this unique business going from one store at the Saint store at the Saint Louis Galleria to something that could be as huge as I thought it could be. My dream eventually came true, and yours can to – believe in yourself. This Thanksgiving I am thankful for all those people that inspired me to be all that I can be. As the holidays draw near, let Holly and Hal be your inspiration that anything you dream is possible. 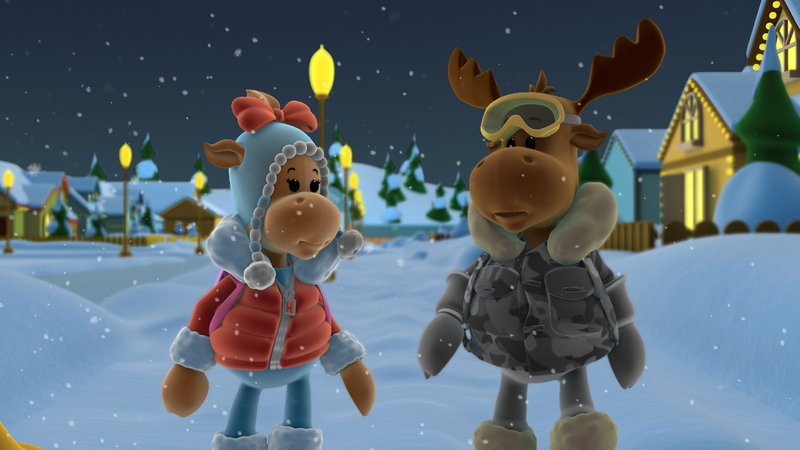 Be sure to catch “Holly and Hal Moose: Our Uplifting Christmas Adventure” on the Hub TV Channel to relive their exciting journey filled with friends and fun. You can also buy the DVD online at buildabear.com or at a local store that sells DVDs! I know I will be watching as this dynamic duo once again let their imaginations run wild to create the perfect Christmas adventure. P.S. A special thanks to Mrs. Adams, my inspiring high school journalism teacher who taught me the power of imagination and believing in yourself. Your determination and creativity is a very special part of Holly Moose! Over the years, I have often written about young people who inspire me – especially those who are recognized as Build-A-Bear Workshop Huggable Heroes. Last week, I had the privilege of working alongside Talia Leman, one of our 2007 Huggable Heroes, and meeting hundreds of motivated, inspiring kids from across the St. Louis region who have that Huggable Hero sparkle in their eyes. Thanks to a BIG idea from Talia, on November 3, Build-A-Bear Workshop hosted nearly 200 students and teachers from 34 area schools for The BIG Return Summit to discuss important community issues and brainstorm solutions. Each school walked away with a tangible project that will help tackle these issues head-on. And because the projects are led by young people, as Talia says, there will be a BIG Return. Talia was recognized as a Huggable Hero for starting RandomKid, an organization that empowers kids to solve real problems by joining other youth who have the drive to change the world. Through her work, Talia found that youth can turn charitable donations into a 200 – 1,000 percent return for a cause because of their determination and drive. She says that because young people don’t know what isn’t possible, they can think and act more creatively. The BIG Return leverages the power of youth to make big changes in the world, and those big changes are happening right here in St. Louis. Talia has brought together St. Louis Mayor Francis Slay, St. Louis County Executive Charlie Dooley and other community leaders to challenge the community to support these efforts – and guess what? Change is happening. It’s this type of “sky is the limit” thinking for social change that motivates me and inspires me to run Build-A-Bear Workshop in the manner we do. It’s always been part of our mantra to give back to the communities where we live, work and play and we love helping energize young people to do the same, and to become venture capitalist for social good. Last Thursday was an important day for Build-A-Bear Workshop, Talia, the participating kids and the St. Louis community. My hope is that this idea of The BIG Return turns into an even BIGGER project – not just for St. Louis – but for the entire nation. Build-A-Bear Workshop hosted the first-ever BIG Return Summit in St. Louis – where will it go next? Chicago? Dallas? Los Angeles? What other cities will step up to the plate and rise to the challenge? I know the energy is there because I saw it from the youth, and it’s contagious. And who knows? Maybe one of those kids sitting in that very room with us last Thursday will be in the next class of Huggable Heroes. Stay tuned as Huggable Hero nominations for 2012 begin in January. Kids have the answers to the world’s problems, if we listen! I look forward to hearing about the projects these kids undertake and the differences they make in our community and the world! I know our St. Louis youth will become role models for other youth across America as they carry out the mission of The BIG Return. It is no surprise that I would write about the inspiring run of our St. Louis Cardinals—after all I live in St. Louis and we believe win or lose, this is baseball heaven. This was even more true this year as we saw our Redbirds come from 10 1/2 games behind in August to win the World Series in 7 nail biting games on October 28, 2011. St. Louis fans are not usually fair weather but this year I had a lot more people tell me they had not attended a game than usual. And while our sales held up at Busch stadium thanks to the diehards, we could see attendance slipping just a little. We all needed some magic. If a squirrel can make it to homeplate, so can you! Of course there is more to winning the Wild Card berth, the NLCS and then the World Series than the motivation a fuzzy, grey squirrel can provide. Like in any business it takes uncommon leadership, plan, a team—24 players + Albert Pujols, determination, encouragement and yes, just a little bit of luck too. The Cards had all that plus a great story. The Hometown boy- David Freese. The Cardinals have given the world something to think about and learn from—giving up is not an option. You have to come to the plate every time as if this is the last. It all matters and there are no sure things—no guaranteed job. Lemons can become lemonade. Change is good and it takes hard work. Thanks David Freese for reminding us that dreams do really come true and being from St. Louis is an honor. The American dream is alive in well in St. Louis, Missouri (home of Beer, Baseball and Bears) aka Baseball Heaven, USA.